Recognizes full-length human Factor VIII. Does not cross-react with von Willebrand factor. F8 / FVIII / Factor VIII antibody was raised against purified human Factor VIII. Store at -20 degree C or -70 degree C. Aliquot to avoid freeze/thaw cycles. This gene encodes coagulation factor VIII, which participates in the intrinsic pathway of blood coagulation; factor VIII is a cofactor for factor IXa which, in the presence of Ca+2 and phospholipids, converts factor X to the activated form Xa. This gene produces two alternatively spliced transcripts. Transcript variant 1 encodes a large glycoprotein, isoform a, which circulates in plasma and associates with von Willebrand factor in a noncovalent complex. 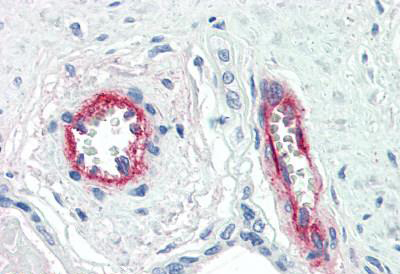 Anti-F8 / Factor VIII antibody IHC of human uterus, vessels. Immunohistochemistry of formalin-fixed, paraffin-embedded tissue after heat-induced antigen retrieval. Antibody concentration 10 ug/ml. 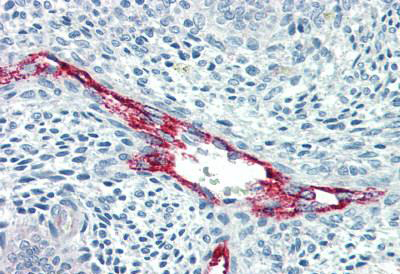 Anti-F8 / Factor VIII antibody IHC of human placenta, vessels. Immunohistochemistry of formalin-fixed, paraffin-embedded tissue after heat-induced antigen retrieval. Antibody concentration 10 ug/ml. 1. Elevated FVIII is an independent risk factor for non-puerperal cerebral venous thrombosis in an Indian population.